Is it actually worth the agony? Most of us, by the time the clock strikes roughly half past four in the morning on January 1st, have had their fill of booze. We've spent more or less a solid month throughout the festive season with a drink surgically attached to our hands, and it's for that reason the first day of the new year tends to bring a moral hangover as well as a physical one, ultimately drawing the conclusion that we should give up the booze for a month. Your body needs a break—your liver is practically pleading with you not to drown it in another double gin and tonic—and you resolve to come off the hard stuff until February 1st. But is it all worth it? What are the actual bodily effects of quitting alcohol, even if it's just temporarily? 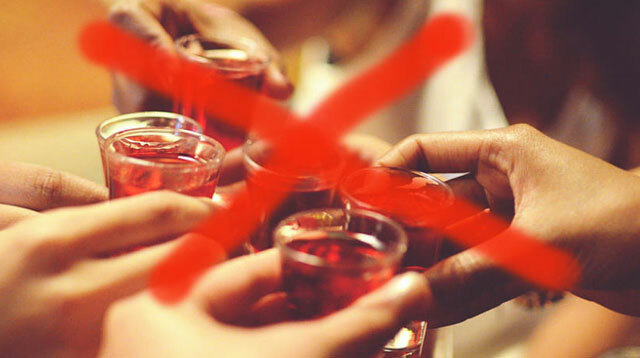 It goes without saying that cutting out alcohol will improve your health, but experts warn it could be futile if you don't do it for long enough thanks to the lasting negative effects alcohol has on your system, even once the booze itself is out of your body. Speaking to Elite Daily, healthy lifestyle and business coach Katie Proctor explains that our livers can metabolize around one standard-sized alcoholic drink per hour, but the more you drink the less productively your liver can do this. And it's not just the alcohol in our system whch takes some bouncing back from; there's also the damage from lack of sleep and drunk binging on unhealthy food to consider. "It can take hours, sometimes even days, before someone feels back to normal after heavy drinking—not only ridding their system of alcohol, but also catching up on sleep or bouncing back from improper eating habits, which may have occurred simultaneously." "I'd say (very generally) that it would take at least two to four weeks of consistently not drinking to see noticeable physical results assuming all other factors stay the same." Proctor does note that you might start to notice some bodily improvements after stopping drinking for just a few days; less bloating, for example, and some slight weight loss due to the hefty calorific content of many alcoholic drinks. And Nutrition Works NY dietician, Sammi Haber, pointed our that you can still see results without completely giving up alcohol. "You don't necessarily have to stop drinking altogether to reap any benefits. Instead, it might be helpful to simply cut down on the amount you drink. The effects of alcohol run on a J-shaped curve, meaning a moderate amount (i.e. one drink a day for women and two drinks a day for men) can be healthy, but as you increase the amount you drink in a day, the negative effects of alcohol quickly increase as well." So from what these experts are saying, it seems like you either need to cut out the booze long-term, or don't try to go cold turkey at all, but instead concentrate on reducing your intake. Either way, your liver will probably thank you for it.